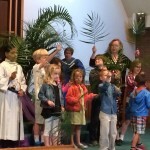 Children of all ages are welcome at our worship services. Children’s bulletins with activities for readers and non-readers are available as you enter the sanctuary. Pastor Sharon delivers a special message for children during the Time with Young Christians at the 9:00 worship service most Sunday mornings. Many children like to use the coloring tables in the sanctuary during the service. Parents may also want to use the rocking chairs, books and toys, or changing table in the Family Room at the back of the sanctuary where they can follow the service on closed circuit TV in an area where children can move around. 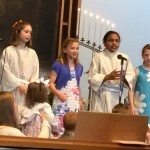 Older children are involved in worship as acolytes and musicians and youth serve regularly as readers and ushers. What (or who) are Acolytes? If you would like to join the acolyte team, email or call Karen in the church office.